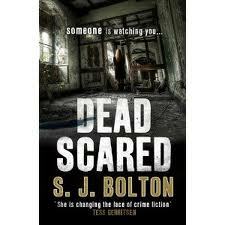 Dead Scared is S J Bolton’s foray into that fairly well-known subgenre of crime fiction – suicides of undergraduates. In this novel, the setting is Cambridge University, and DC Lacey Flint (not her real name) goes undercover, pretending to be a psychology undergraduate of a nervous disposition, in order to (she is told) draw out anyone who might be involved in the rather high death-rate of female students in recent years. The author is excellent at creating an atmosphere of paranoia and danger, as Lacey is cut off from her superiors – she can only report to one officer, DI Mark Josebury, and rapidly finds herself out of her depth as her pretend feebleness attracts some truly nasty mass-bullying of a nature that I can only hope is entirely fictional. The internet is involved – Lacey not only has to contend with pictures of her ordeal being put up on college noticeboards, but with the images being available online. Nobody seems interested in helping her apart from her rather odd room-mate. The previous suicide victims have experienced nightmares; a sense of being watched or, in some cases physically attacked while asleep; and have possibly been taking drugs. It isn’t long before Lacey begins to experience the same symptoms. S J Bolton also specialises in unrequited(-ish) love, which is a double theme in this novel. Lacey and Josebury have met in a previous book and have fallen for each other, though neither can admit it. (This novel, Now You See Me, is the only one of Bolton’s I have not read, but this does not seem to matter from the point of view of enjoyment of Dead Scared.) The plot is somewhat slowed down by frequent descriptions of the feelings one of them has for the other but of course cannot reveal (!). Another character here is psychologist Evi Oliver, the only person in Cambridge who knows Lacey’s true identity and who helps her try to identify the other young women who have killed themselves (information not provided or even admitted to Lacey by her superiors) and, later, whether their deaths might not have been self-inflicted. Evi herself is suffering from her love for Harry, another story told in a previous book (Blood Harvest) – and again, neither Evi nor Harry contacts the other, so we are treated to much wistfulness on Evi’s part. These romantic distractions aside, the author builds up the tension superbly, as Lacey continues to accrue evidence that the dead women were murdered and turns up several likely suspects, despite Josebury’s anger as he wants Lacey to stick to her decoy role. Lacey and Evi separately discover more and more, but also both become increasingly aware of being targeted by intangible yet terrifying forces. Eventually Lacey works out what is going on at the same time that she and Evi are cut off from help and plunged into danger. Although part of me was annoyed at the plot holes that have artificially allowed things to get to this point (for example, Josebury has to go away to see his son as the investigation reaches its climax, so Lacey has nobody to report to – and many others which I can’t reveal here because of spoilers), the tension towards the end of the book is almost unbearable as Lacey and Evi appear to be doomed. This book is definitely a very exciting read and one that really does require staying up late until it is finished. The eventual revelation of what really has been going on is one that the reader will have worked out in outline but (probably) not in detail, and is very dark and disturbing. I obtained my copy of this book via the Amazon Vine programme. Other reviews of the book can be seen at UK Amazon. Euro Crime reviews of S J Bolton’s previous books. Maxine – An excellent review! I’ve not read all of Bolton’s work, but from what I have read I agree that Bolton does a very effective job of building up suspense and creating a very creepy atmosphere. Plot holes aside, this sounds like a very dark and fascinating look at the university setting. I’m going to have to check it out. Thanks, Margot. Sometimes as a reviewer it is very tempting to note that you have spotted some plot holes but of course one must not do this! Nevertheless, this is a good one, I think. Maxine – Haven’t read any Bolton yet, but after reading your review I’ve added all three you mention to The List. Glad you included the relationship histories in the two previous books. Thanks, Ken. Our snowfall seems to have been and gone – for now, anyway. By the way, thanks again for that recommendation, I found the book is very cheap on Kindle over here so I have downloaded it. On Bolton, her first two are complete standalones, so if you want a good place to start, Blood Harvest (her third) is a good one to go for. Very atmospheric Lancashire moors story. As mentioned, I haven’t read Now You See me (her fourth) but didn’t feel I lost anything by going from BH to Dead Scared (#5). Another author who I have seen on the shelves but not read. I actually thought the author was a man, which goes to show that disguising your gender can be quite confusing for the reader. the setting sounds quite interesting – I might give the author a go.